Beneath a Steel Sky was released in 1994, and was the second game by Revolution Software. In a dystopian future, Robert Foster uncovers a government cover-up and secrets to his past as he tries to escape the city. The original version is free from ScummVM, and is playable on many different computer operating systems and video game consoles. A remastered version was released in 2009 for iPhone and iPod Touch with new animated sequences, a hint system, and improved audio quality. 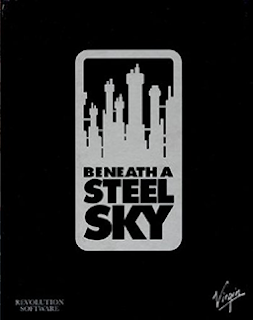 Beneath a Steel Sky: Remastered was also released for the iPad in 2010. The original version of Beneath a Steel Sky is now supported by ScummVM, a program designed to let 2D adventure games run on multiple platforms. With ScummVM, Beneath a Steel Sky now runs on modern versions of windows, as well as Linux, Mac OS X, and many consoles such as Dreamcast, Wii, PlayStation 2, and PlayStation Portable. For a complete list of platforms supported by ScummVM, see here.